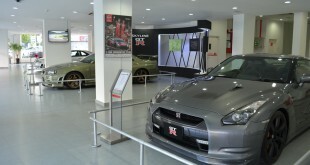 The Nissan GT-R is a super car by most standards, features and track records. Nissan claims the GT-R can reach a top speed of 310 km/h with it’s 472hp monster 3.8 litre V6 Twin Turbo. It has been tested to achieve 0-100 km/h in 3.5 seconds and 11.6 seconds for a quarter mile. GT-R it’s frighteningly fast which allow you to pull up next to just about any other car at a traffic light. However, this provided that you never happen to meet a Bugatti Veyron. The Bugatti having doubles the number of turbochargers and horsepower of a GT-R. While a heads-up drag race between the GT-R and Veyron is an unlikely occurrence in the real world, Evo Magazine took it upon themselves to pair the two cars on an open airfield. Watch out the video and check how much faster is the Bugatti than the Nissan.